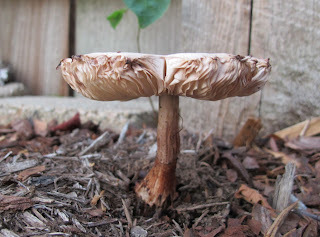 We are garden fairies and we assume that everyone knows that whenever a mushroom pops up in the garden, it is a sure sign that the garden fairies will soon be gathering for a big party. Did you get your invitation to the party? You surely did if you are celebrating the rain like we garden fairies are. In fact, even if you didn't get an invitation, you are invited anyway. We are garden fairies and invitations are strictly optional because we really don't have time to address envelopes, figure out stamps, figure out how to get to the post office, etc. Instead, we are focusing, as much as we garden fairies can focus, on celebrating and we plan to celebrate through the night and all weekend. After all, if you don't celebrate rain, well, that's just rude and ungrateful. We are garden fairies and we would like to explain that why it didn't rain in May, June, and July, but now that it is August, it is raining again. We would like to explain it but we don't understand it anymore than anyone else. Instead, we'll just marvel at the mushrooms popping up in the mulch after the rains last night and try our very best not to accidentally knock any of them over during the celebration. But we are garden fairies. We make no promises, except the promise to try. We think trying is the most important thing. Try to grow different plants. Try to adapt to the drought. Try to weed. Try to clean up the garden. Just try and we are garden fairies, we know it will turn out alright. Garden fairies - You always make my day when you come out to post! I am most definitely celebrating our wonderful rain. As the sun came up this morning, i found all kinds of things laying around the garden. there were little plates and wine cups no bigger than my fingernail. so i am sure that there was some big time partying in my garden last night. Could y'all please stop rubbing your rain in the dry faces of the rest of us? I hope the party was grand! We had our own little celebration here. So thankful for the ain! I always enjoy your guest writes Garden Fairies. Your relatives have been busy over here in Tucson as well:) Happy days! My invitation must have gotten lost in the mail, but I celebrated anyway--we had two inches of rain in one day last week!